U.A. is the #1 ranked High School for heroics and is considered as the top Hero Academy in the world. As such it as a pretty low acceptance rate. With plenty of other students who may have aspired to be in UA, it is surprising that Mineta Minoru was able to get in to UA. His quirk seems pretty useless in battle. Additionally he was just above Midoriya in Aizawa's Quick Apprehension Test at 19th rank in the class. He has been shown to be a coward and was pretty scared when the villains attacked. How was he able to defeat enough machines to pass the UA high entrance exam? 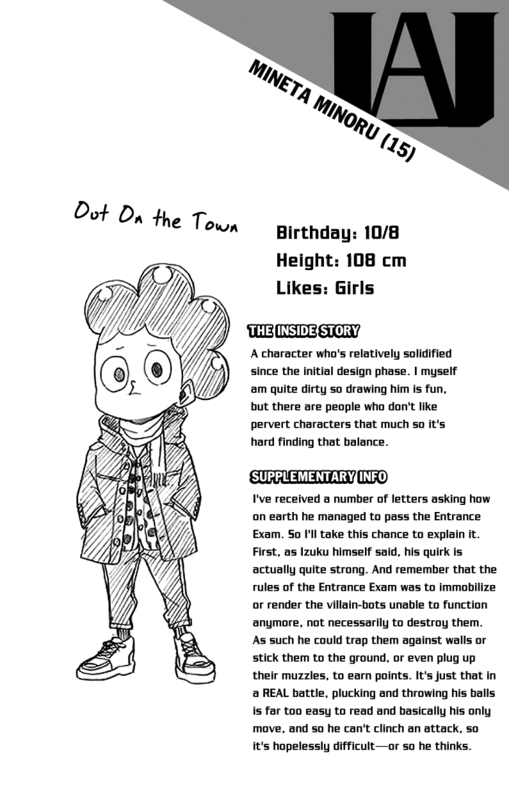 Thus Mineta though typically using his quirk just for throwing the balls has the technique and intelligence to stop the villain bots and rack up the points pretty easily, hence gaining admission to UA! Why does Bakugou drag Kaminari into the bushes and what did he do to him there? Why doesn't Midoriya get any recommendations despite his good performance in the tournament? What does Eijiro Kirishima harden his body into? Why Midoriya arms are weaker than his legs and get broken more easily?